Dartmoor Windows work in partnership with a large local fabricator to help create our SMART profile sliding patio doors and a local specialist manufacturer to produce the double glazed sealed units. Working closely with our fabricators and manufacturers offers us more control of the quality of the finished product and, in turn, more variety to our clients with the glazing and hardware preferences that go into creating your unique made to measure sliding patio door. 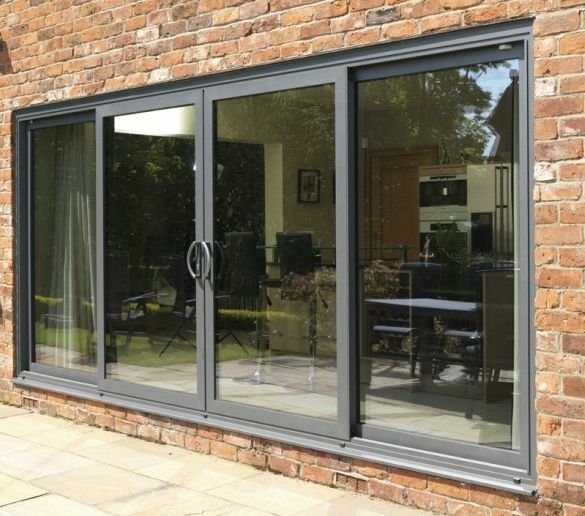 The Aluminium Sliding Patio Doors are part of Dartmoor Windows Premier Range which are produced using the same SMART profile system as the windows and other door types; keeping the continuity of our Premier Range. The enhanced security multi-point locking systems designed, developed and tested in the UK to deliver the highest levels of performance, offers homeowners security and peace of mind. Each lock features a combination of hooks and anti-lift bolts for greater security. Depending on the system choice (either internally or externally glazed, including security fixings for externally glazed), this all contributes to these undoubtedly safe, strong doors and with slim, elegant architectural lines, the correct style, design and finish are suitable for a range of properties.